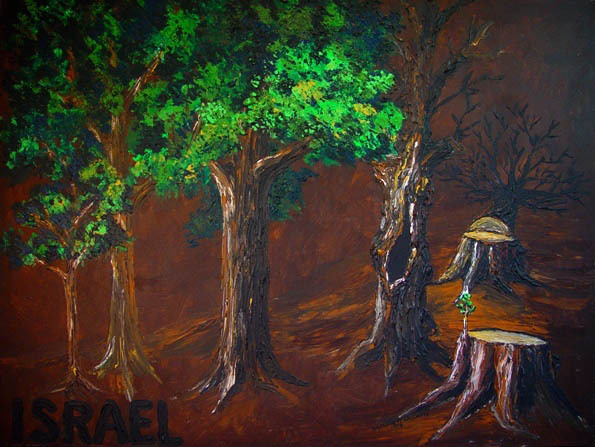 In 1978 at Moravian Theological Seminary, at the close of one of my courses studying the book of Isaiah, reflecting on the history of Israel, this painting emerged. Touched by the verses, Isa. 11:1 and following…… “A shoot will come up from the stump of Jesse, from his roots a Branch will bear fruit………” and Isa. 53:2 “He grew up before him like a tender shoot, and like a root out of dry ground……..” I saw Israel’s history as like the history of some trees. The single seed of Abraham, the sapling years, the maturing years and then the peek glorious years with King David and the beginning rule of King Solomon. Then came the years of turning away from God so as to cause such extreme decay, as the hollowed out dead tree, Israel got cut down and carried off to Babylon. BUT, GOD FOREVER IS FAITHFUL! Out of a seemingly lifeless stump comes the shoot of hope. How might our lives look like this? Can you relate to this amazing story?